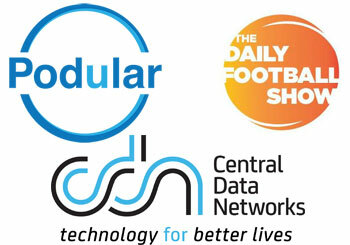 Central Data Networks (CDN) are pleased to announce a partnership agreement with National Media Company, Podular Media, who are the owners of the very engaging and popular Daily Football Show (DFS). The official agreement will see CDN and DFS work on a number of projects together, including some exciting innovative products and collaborations that will break new technology grounds over the coming months of the Australian football calendar. “CDN have been supporting grassroots football since our inception in 1994 and are pleased to continue to support the world game along with the support of our national and international customers through our software developments and data centre applications,” said Managing Director, Robert Zanier of Central Data Networks. “Content is an invaluable source of credibility and exposure, so we’re excited by the opportunity to work closely with CDN and we’re committed to producing more rich, quality content that’ll reignite discussions around one of the hottest topics in Australian football,” said Managing Director, Adrian Houghton of Daily Football Show. To learn more about CDN’s unique CloudVue technology and how it can help your business, visit – http://cloudvue.com.au/. Australian football lovers who are not familiar can access the DFS podcast via iTunes, Whooshkaa and all of your favourite Android apps or via http://dailyfootballshow.com/ with every episode airing at 4pm EST.